The CCTV camera is one of the unique inventions of modern technology as it is a useful security tool. Bosch is a leading manufacturer of surveillance system that enables people to create a safer world. The company excels in producing versatile cameras used for security which includes IP cameras, Analog cameras, Network Video Recorders, Digital Video Recorder and many more. It offers us security, safety and protected features that help people to explore the business positively. Installation is the primary step if you want your CCTV to function smoothly. If your CCTV is not installed, it might stop working and endanger your secure network. As we rely on CCTV for safety and security any errors with it is not acceptable. Whenever you note a simple glitch with your CCTV camera, do not take it lightly. Contact UAE Technician for proper guidance. 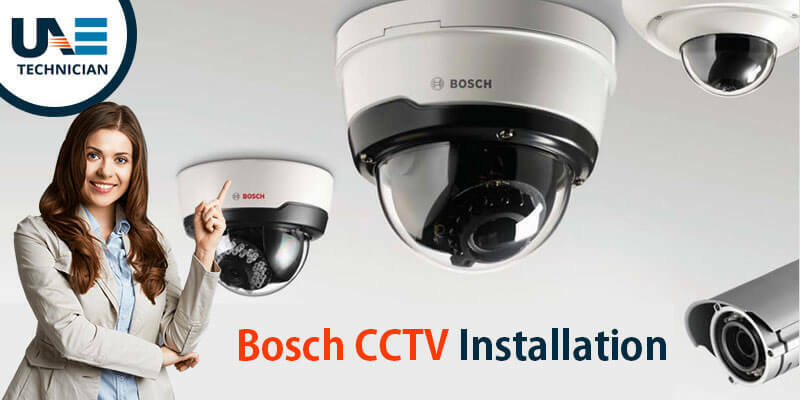 We will provide you with best Bosch CCTV installation services that will help to nullify your worry at an instance. The above-listed issues might hamper the entire procedure of your CCTV installation. Reach our experts for Bosch CCTV maintenance requirement. Our professionals are well-acquainted with the device and hence can provide you with the exact solutions that will help you to install the CCTV correctly. We provide instant assistance CCTV surveillance cameras not providing you with proper indoor and outdoor protection. Our tech experts provide you with threat and risk management. We also protect your CCTV from getting obsolete by upgrading it. You can easily monitor your CCTV on mobile application or browser with our expert’s assistance. Our repair team ranks at the top when security service is the concern. UAE Technician offers us simple security solutions that will help you to maintain a state of peace. We are efficient to provide our customers with an instant service irrespective of the time. Users can also opt for our online services that are helping users with adequate solutions. We aim at providing our customer’s satisfaction. Do not think twice while dialing our Bosch CCTV maintenance services number: 042053349 and get rid of all your security problems. We also provide CP Plus CCTV installation in Dubai.